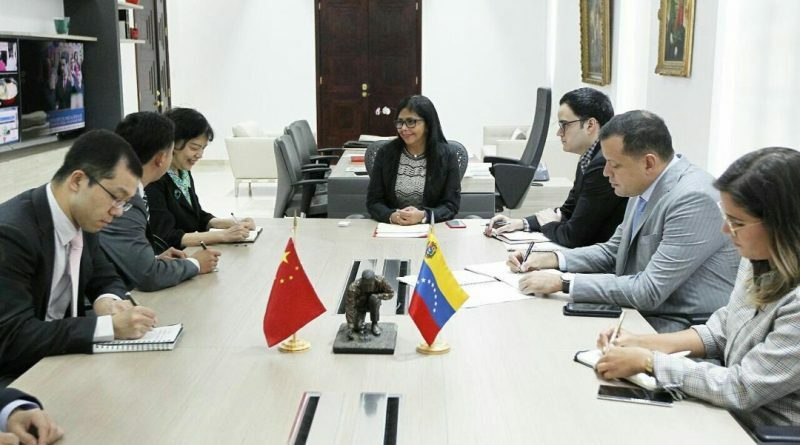 From the headquarters of the Vice Presidency of the Bolivarian Republic of Venezuela, located in Caracas, a high-level bilateral meeting was held with the Delegation of the People’s Bank of China, with the purpose of strengthening the cooperation ties between both nations. The activity was led by the executive vice president, Delcy Rodríguez, along with the Deputy Director General of the Bank’s Research Department, Wang Yu, as well as Li Wenzhe, Deputy Director of the Monetary Policy Department, Ma Zhiyang, Chief Department of Monetary Policy and Xiao Lin, Section Chief of the Department of International Relations. As part of the Economic Recovery, Growth and Prosperity Program, promoted by the National Government, President Nicolás Maduro has promoted the strengthening of cooperation with the People’s Republic of China, as well as boosting the economic, commercial, financial and multidimensional relations reached. during years of Binational cooperation. Likewise, Rodríguez held a meeting with representatives of the Government of the Russian Federation, with the purpose of strengthening alliances and bilateral agreements with the Eurasian country and one of the main economic and commercial allies of Venezuela. Earlier, the Executive Vice President chaired a meeting with the Delegation of the Islamic Republic of Iran, led by the Minister of Defense and Logistics of the Iranian Armed Forces, Amir Hatami, in the interest of advancing cooperation for safeguarding and mutual development. These actions are part of the Diplomacy of Peace promoted by the Venezuelan Head of State, for a pluripolar and multicentric world.